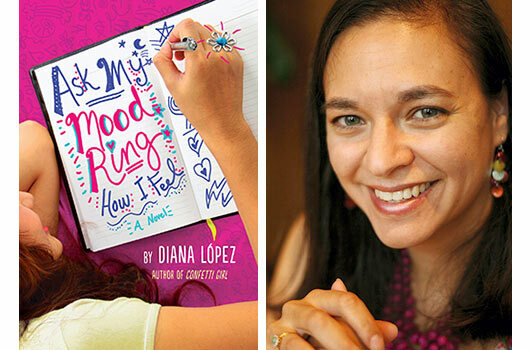 Diana Lopez debuted with a middle grade novel Confetti Girl (Little Brown). It was published in 2009, won the 2012 William Allen White Children’s Book Award and earned its author many great admirers due to her engaging voice and wonderful ability to make potentially difficult topics easier for kids to digest. López’s latest middle grade novel, Ask My Mood Ring How I Feel (Little Brown) once more delivers a story that is universal, engaging, and terribly important. Missing from discussions about how breast cancer affects a woman’s personal world is how this diagnosis affects those women’s children, and what they have to go through, often with little support from those around them due to the extraordinary circumstances. With her latest novel, López seeks to bring this topic to light as she continues to inspire and entertain young readers. Matching the generous spirit of her novels, López shared with us her inspiration for her latest book, and her thoughts on hope, and the power of stories. 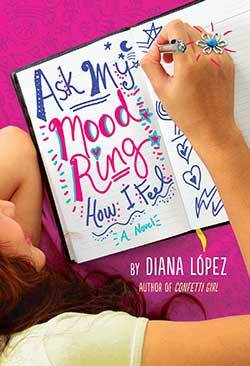 Mamiverse: What inspired you to write Ask My Mood Ring How I Feel? DL: I was inspired by the Race for the Cure 5K in San Antonio, Texas. My family participated to celebrate my Aunt Gloria’s remission from breast cancer. There was so much positive energy, so many images (a pink poodle, carnations, drum circles, banners), and of course, stories. Stories of loss, of hope, of celebration, but also the stories people shared while walking. My husband was a radiation therapist at the time, so I heard cancer stories from him too. It’s a disease that affects so many, and I wanted to explore how different people react. I knew I had a book idea when I pictured a woman buying nine bikinis because she wanted to show off and enjoy her figure before having a mastectomy. The act of buying nine bikinis told me everything I needed to know about this woman. She’s a fighter, she has a sense of humor, and she looks for the bright side of things. But I didn’t want to write her story. I wanted to write her daughter’s story. Mamiverse: Why did you choose to tell the novel from Chia’s point of view? DL: I wanted to investigate how something life-altering like breast cancer affects the family, and in particular, adolescent girls. For them, first bras, first periods, first dates are important milestones. Preteen girls are increasingly aware of their sexuality and usually excited about their physical development. But what happens when you learn that your body can turn on you and for no apparent reason? Chia and Carmen (her sister) gave me the perfect opportunity to explore these questions. Also, we tend to think of middle school kids as naïve and immature, but some are amazingly resourceful. This is Chia. Her family needs her, and she answers the call. I really admire the way she faces her responsibilities. There are so many kids like her. Maybe their parents are sick or working long hours, so the kids have to take over the household in addition to keeping up with school. They don’t have time to mess around. That’s Chia’s predicament. She’s so busy helping everyone else that she forgets to take care of her own needs. Mamiverse: Where did the idea of the “mood ring” come from? How did you decide to link that particular object to the narrative? DL: When you’re writing for a young audience, you have to dig into your own past. I remembered Chia pets and mood rings. They’re so seventies, and I thought I’d give Chia’s world this retro feel. At first, I just wanted to have fun with the imagery, but as I started to write the book, I realized that Chia has a difficult time expressing her emotions and is often confused about how she feels. The mood ring became a perfect way to play with the idea of sharing/withholding your feelings. Mamiverse: Chia, her sister Carmen and her father all do their share of household work while Chia’s mother is getting treatment. What advice would you give mothers, daughters and families affected by breast cancer? DL: As I mentioned before, my husband worked as a radiation therapist for several years. He saw people quickly succumb to cancer, and others who outlived all expectations. There are no guarantees and no way to predict what will happen, but my husband did notice an important factor—positive attitude. He insists that you cannot underestimate the importance of a supportive family and faith when dealing with illness. I believe him, and I wanted these themes to shine through in the book. But like I said, there are never any guarantees. That’s one reason why I left the story open-ended as far as Chia’s mother is concerned. So when it comes to dealing with illness, my advice is very simple: keep the hope. Mamiverse: How has your family reacted to the novel? Has it affected the way any of you approach breast cancer, or illnesses in general? DL: It was a special joy to see Aunt Gloria at my reading in San Antonio and to be able to share the book with her and her family. But most of my conversations with family took place while I was writing the book. I relied on my husband for information about radiation therapy, and my mother and I took a trip to the Valley to visit El Cuarto de Milagros, where an important scene in the book occurs and where we often go to pray for loved ones who are ill. A couple of days ago, I had a Skype chat with my nephew, Steban, who has just finished the book. He’s 12 and the oldest in his family, so we discussed how Chia’s life changed when her mother got sick. He also said that his favorite character is Gumwad. But to get back to your question, the book hasn’t changed the way my family deals with illness. We tend to rally when someone gets sick. It’s one of the things I love about my family and a source of inspiration for the novel. Mamiverse: Middle grade novels have grown tremendously in popularity in recent years. What do you think makes this age group so compelling to write for? DL: It’s a time of transitions—the move from elementary to middle school (its lockers, dressing rooms, electives, and cliques), the move toward an adult body, and the move to a more abstract way of thinking. These are definitely the formative years, and a time of waking up to some very disturbing insights—Mom and Dad get scared too, life’s not fair, friends might lie or manipulate, and sometimes people, good people, die. But also, middle school is a time of firsts, so there’s a heightened intensity that really settles down as we get older. I think adults read these books to recapture that sense of newness, and kids read them to find assurance that they are not alone. DL: Yes, I am writing another middle grade novel called Nothing Up My Sleeve. This one features boys, and I’m writing it with my nephews in mind. But also, I know way too much about close-up magic without actually being a practitioner. It’s my husband’s hobby, so over the years, I have learned the lingo and attended magic conventions. Every Labor Day weekend, the TAOM (Texas Association of Magicians) Convention hosts an amateur competition, which has inspired me to write a novel about three boys whose friendship is put to the test when they all sign up to compete. Mamiverse: Do you have any favorite children’s books that you would like to recommend to our mamis? DL: Lately, I’ve been into dystopian fiction books like Matched by Ally Condie and Divergent by Veronica Roth. I’m also reading Candymakers by Wendy Mass because it uses the viewpoint of three boys and a girl, which is what I’m working with in my current project. Plus, I met the author last year, and she’s really nice. I also suggest Wonder by R. J. Palacio, which was recommended to me by students I met in the Valley last spring. I’d like to ask all our mamis to find out what their children are reading even if it seems silly like Beware the Ninja Weenies or Captain Underpants (my nephews’ current books). Then read along with them. Nothing warms my heart more than receiving a letter from a mother who read my book because her daughter recommended it. Can you think of a better way to start a conversation with your kids? For more information about the author, visit her webpage. You can also “like” Diana on Facebook, where she posts reviews, interviews, and information about her upcoming events. There, she is also always happy to share pics of wacky socks in honor of Lina, the sock-crazy protagonist of Confetti Girl!